Fort Alcatraz (1859-1934) - Declared a military reservation 6 Nov 1850, construction started 1853 under the supervision of 1st Lt. Zealous B. Tower, U.S. Corps of Engineers on Alcatraz Island, San Francisco County, California. The post was first garrisoned on 30 Dec 1859. Became a military prison in 1907 and a civilian prison in 1934. 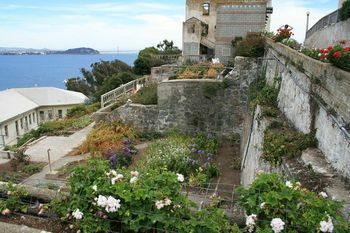 Officially known as Alcatraz Island but often referred to as Fort Alcatraz, also known as Camp Alcatraz and Prison Post at Alcatraz Island. 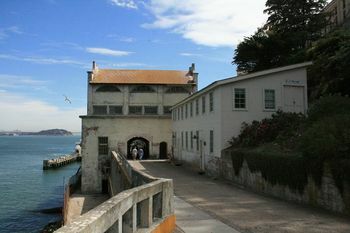 Part of the Harbor Defense of San Francisco. Initial construction began in 1853 under the supervision of 1st Lt. Zealous B. Tower, U.S. Corps of Engineers, and included four gun batteries, a 200' by 100' brick citadel, two barracks buildings, and three cell blocks. By 1858, the four batteries were virtually complete and armed. The South, North, West, and Three Gun batteries contained a total of 73 large guns including eight 10" Columbiads, forty-four 8" Columbiads, six 42 pounder smoothbore cannons and eight 24 pounder howitzers. The fort barracks was completed and the post was garrisoned on 30 Dec 1859 by Company H, 3rd U.S. Artillery, commanded by Capt. Joseph Stewart. The island was a key artillery post guarding San Francisco Bay against Confederate raiders and was the most heavily armed post in the San Francisco Harbor. By 1861, the fort had 86 cannon and a garrison of 130 men. Later in the war, the garrison and the armament were further increased. The Army also imprisoned deserters, insubordinate soldiers and Confederate sympathizers on the island during the war marking the beginning of the prison role for the island. Fortifications on the island expanded during the war and evolved into an almost continuous set of batteries along the north, west and south sides of the island. The practice of naming batteries for the compass points they faced proved too confusing, and later in the war batteries were named for military figures, including those who supervised the construction of the post. The north side of the island held Battery Halleck and Battery Rosecrans. The west side included Battery Mansfield, Battery Stevens, Battery Tower, Battery McPherson and part of Battery McClellan. The south side included part of Battery McClellan, Battery Prime, and the Three Gun Battery. An inspection of Alcatraz fortifications in 1868 found a total of 155 large caliber weapons, 105 mounted and 50 unmounted. 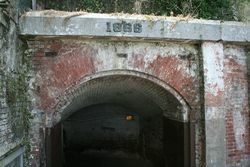 Construction was stopped in 1866 on casemates because of their vulnerability to the new rifled guns and the "very imperfect" defenses of the island. 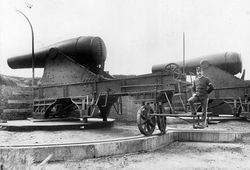 In 1870, a new plan was approved that called for thirty-five 15" Rodman cannons and 20 magazines organized into 13 batteries. 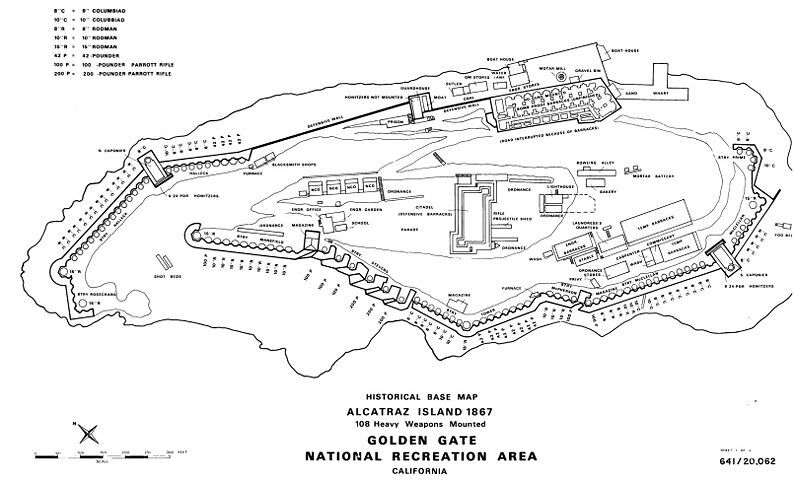 In 1868, the Army established a permanent military prison on Alcatraz that housed a disciplinary barracks for military personnel and later a POW camp for Spanish-American War prisoners. After the 1906 San Francisco earthquake it was used to temporarily house civilian prisoners from the city jails. In 1907 it reverted back to being a military prison. On 21 Mar 1907, Alcatraz was officially designated as the Western U.S. Military Prison. In 1909, the Army demolished much of the original fort including most of the citadel and started building a new prison that included the huge concrete main cell block that was completed in 1912. During World War I the post was used to house conscientious objectors. In 1934 the Army turned the post over to the Federal Prison System. 1901-10 1903-04 Lt. Col. Merrill, Abner Hopkins 2132 Cullum entry for this officer conflicts with the next. 1903-02-26 1903-03-22 Maj. Gardener, Cornelius 2504 While commanding post, he was promoted to Lieutenant Colonel, Feb. 18, 1903. Cullum entry for this officer conflicts with the preceding. Part of the Golden Gate Recreation Area (GGNRA) administered by the National Park Service. Few of the original military buildings remain and only the guardhouse and sallyport recall the early military era. 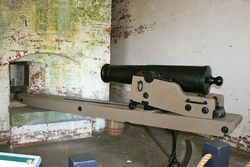 The museum portion of the guardhouse has one of the flank howitzers on display and the circular metal gun emplacement races can be seen in the floor. The old military prison cell block below the guardhouse is restored and very interesting. Location: Alcatraz Island, San Francisco County, California. This page has been accessed 32,769 times. This page was last modified 10:02, 17 March 2019 by Bill Thayer. Based on work by John Stanton and FortWiki anonymous user 74.132.226.148.